Spanish guitarist Paco de Lucia has died aged 66 in Mexico, reportedly of a heart attack while playing with his children on a beach. 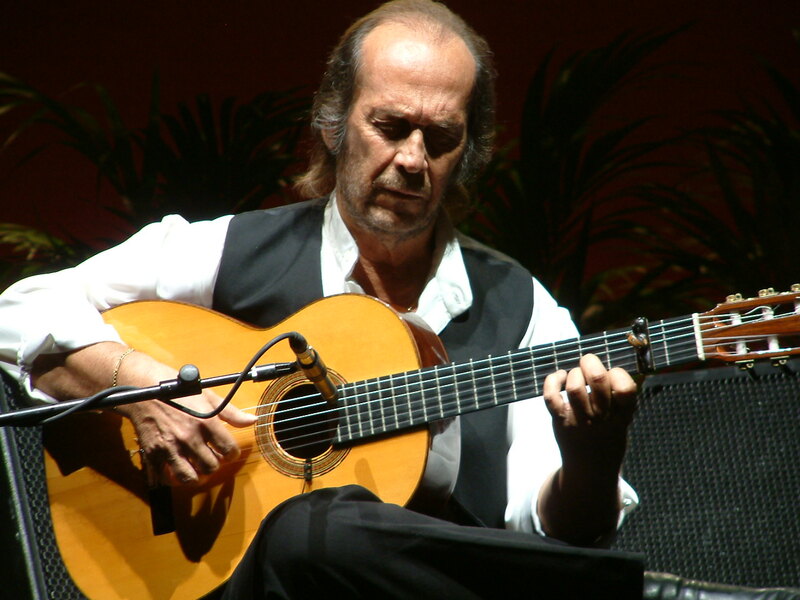 Paco de Lucía (born Francisco Sánchez Gómez on 21 December 1947, died February 2014) is a Spanish flamenco guitarist, composer and producer. A leading proponent of the New Flamenco style, he is one of the first flamenco guitarists who has also successfully crossed over into other genres of music such as classical and jazz. Richard Chapman and Eric Clapton, authors of Guitar: Music, History, Players, describe de Lucía as a "titanic figure in the world of flamenco guitar", and Dennis Koster, author of Guitar Atlas, Flamenco, has referred to de Lucía as "one of history's greatest guitarists". De Lucía is noted for his innovation and colour in harmony and his remarkable dexterity, technique, strength and fluidity in his right hand, capable of executing extremely fast and fluent picados. A master of contrast, he often juxtaposes picados with rasgueados and other techniques and often adds abstract chords and scale tones to his compositions with jazz influences. These innovations saw him play a key role in the development of traditional Flamenco and the evolution of New Flamenco and Latin jazz fusion from the 1970s. De Lucía achieved acclaim for his recordings with flamenco singer Camarón de la Isla in the 1970s, recording 10 albums together. Some of his best known recordings include "Río Ancho" (later fused with Al Di Meola's "Mediterranean Sundance"), "Entre dos aguas", "La Barrosa", "Ímpetu", "Cepa Andaluza" and "Gloria al Niño Ricardo". His collaborations with guitarists John McLaughlin, Al Di Meola and Larry Coryell in the late 1970s saw him gain wider popularity outside his native Spain. De Lucia formed the Paco de Lucía Sextet in 1981 with his brothers, singer Pepe de Lucía and guitarist Ramón de Algeciras, and collaborated with jazz pianist Chick Corea on their 1990 album, Zyryab. In 1983 he appeared in Carlos Saura's film Carmen, for which he was also nominated for a BAFTA Award for Best Film Score. In 1992, he performed live at Expo '92 in Seville and a year later on the Plaza Mayor in Madrid. In 2004, he won the Prince of Asturias Awards in Arts and in 2010, was awarded an honorary doctorate by Berklee College of Music in Boston. Since 2004 he has greatly reduced his live performances in public, has retired from full touring, and now typically only gives several concerts a year, usually in Spain and Germany and at European festivals during the summer months. In 2005, he was nominated for producer of the year by the Latin Grammy Award for La Tana's Tu, Ven a Mi album.